Las Vegas Welcomes The Spread Of Sports Gambling While the Supreme Court decision means more competition for Las Vegas, casino executives and longtime bookmakers in Nevada say the move is good for everyone in the industry. People place bets at the Sports Book at the South Point Hotel and Casino in Las Vegas. 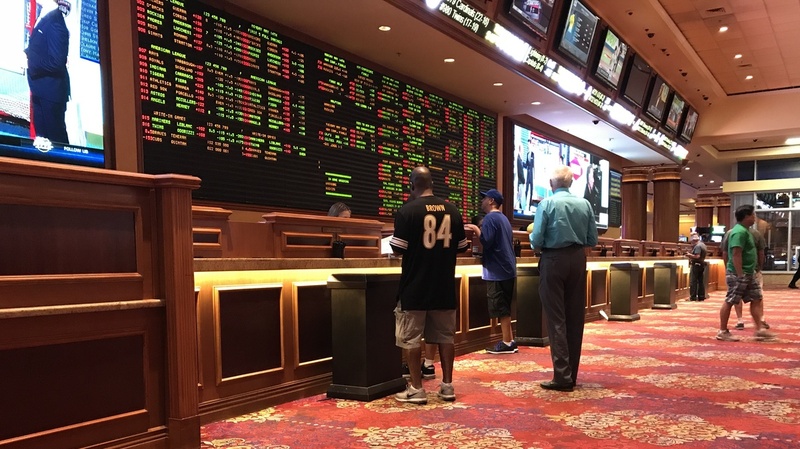 At MGM Grand Las Vegas, a bookmaker takes bets on sports events at the round counter at the Race & Sports Book near the casino. Hockey is among the games being broadcast on 47 flat screens above while gamblers sit in leather seats to watch and strategize. For years, Las Vegas has held a fairly exclusive lock on legal sports gambling like this in the U.S. But a Supreme Court decision to strike down an act that effectively banned it in most of the rest of the country now means other states can permit and regulate it, too. And while that means more competition for Las Vegas, casino executives and longtime bookmakers in Nevada are welcoming the decision. They say permitting sports betting is good for everyone in the industry. Besides, they say, people come to Las Vegas for more than that. On this day, Kevin Olson and Josh Sturm are on a guys' trip, mostly to play cards and golf. The sports betting is just the icing, they say. "Honestly, there's a lot of avenues online that you can use, and people that we know and myself use online sports betting quite often," Sturm said. "So it's really, it's not a lucrative thing that we have to come to Vegas just to be able to do it." Sturm is referring to the millions of people already betting online. The American Gaming Association estimates that people bet $150 billion on professional and college sports illegally every year. But Sturm prefers to gamble and make bets in person. "You know you always wonder 'is there some element of cheating?' I guess," he said. And soon enough, Sturm and his friends might be able to make these bets — legally and in person — closer to their homes in Austin, Texas. "If something opens up in Texas," Olson says, "I feel like I would be doing a bit more sports betting just year-round. Not just here in Vegas." But he'll still head to Las Vegas for the experience: golf, cards, slots, shows, restaurants. And that is what bookmakers and casino executives are banking on. They hope that Nevada will be a model for newcomers to the regulated sports betting industry. "Yes, we've enjoyed a monopoly or a near monopoly on sports betting, but Las Vegas benefits when there there's interest in our field, in our field of entertainment sports, sports betting, gambling in general," said Jim Murren, the chairman and CEO of MGM Resorts International. "It will promote activity, increase fan interest in the team, in the sport, in the league which we believe will in turn increase their interest in going to the sports mecca of sports betting and gambling: Las Vegas." Murren says people were also worried about Las Vegas when legal gambling went to other states and to Native American reservations. "And yet Nevada has grown through that period of time," he said. MGM hopes to expand sports betting to its other properties in the United States and its online betting app. And with it becoming a legal and regulated industry, Murren said, it's just one more step toward erasing the stigma often attached to the industry as predatory. "The traditional view of the casino industry is starting to evolve, but it will be viewed much differently five years from now and this will be a major reason why," he said. Currently, sports betting is a drop in the bucket of money made in Nevada off gaming. In the last fiscal year, Nevada took in $688.6 million in a tax fee on gambling and just over 2 percent of that came from sports betting according to the Nevada Gaming Association. The association welcomed the ruling and offered its expertise to other states that will be regulating sports betting. But what does this mean for bookmakers like Jimmy Vaccaro, who has been doing this work for 41 years? "It's a big day," Vaccaro said at the South Point Hotel and Casino just off the Las Vegas Strip. The in-house satellite radio station praised the decision as enlightened. "Now with it being nationwide, it's going to have an impact, there's no doubt about it," he said. "It will be a little less only because if you live in California, you don't have to run over here to make a bet, you could do it right from there." There will be fewer people through the doors. But "there will be plenty of opportunities a lot of other places for people like us to, in a sense, run their book for them, only because of what we have done, only because the way that we do business, only because of what we do and how we handle it," he says. "We will get opportunities. I think the opportunity will outweigh drastically the little part that we lose people coming to the South Point." All day, Vaccaro has been in meetings discussing the decision. There is a lot to be ironed out to make sports betting lucrative — from state taxes in other places to whether the leagues get a cut of the bets. Bookmaking has changed since Vaccaro started decades ago — betting has moved online and there is a higher cost to air professional football games. But bookmakers adapt, he says.